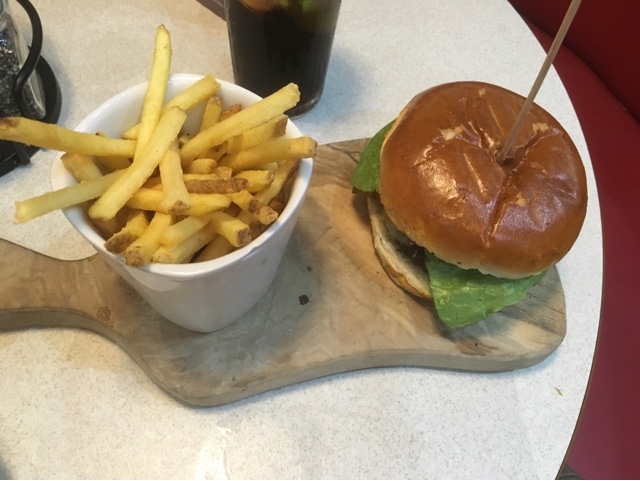 We were recently invited down to Hollywood Bowl at the Red Dragon Centre in Cardiff Bay for a game of bowling and some food. Hollywood Bowl have a passion for bringing families and friends together for affordable fun and healthy competition, giving everyone who visits their centres that feel-good factor. A visit here isn’t just about the brilliant bowling… it’s about enjoying good times together, and that’s why they’re proud to offer so much great entertainment under one roof – including great food, drink, amusements and pool. When we arrived we checked in at the bowling desk and were then greeted by the manager who showed us to the diner where we decided to have our food sitting down first before we started our bowling. The manager introduced us to a lovely man who waited on us. 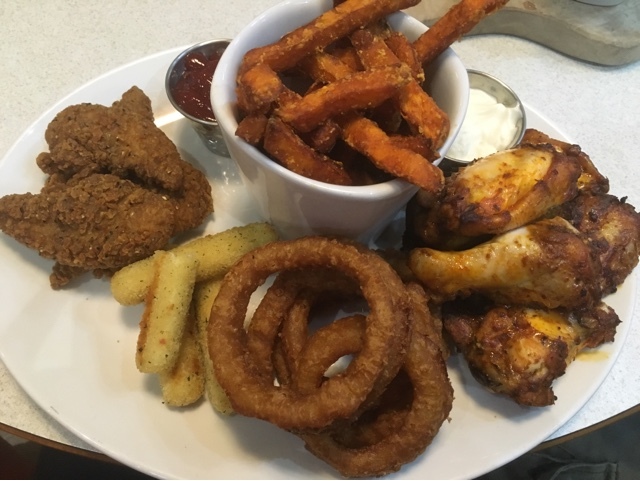 I ordered the sharing platter which consisted of hot and sticky buffalo wings, onion rings, spicy mozzarella melts, southern fried chicken, bbq sauce, sour cream dip and a heap of sweet potato fries. And my husband had the beef burger topped with bacon and cheese, the food was delicious and I really didn’t share my platter! 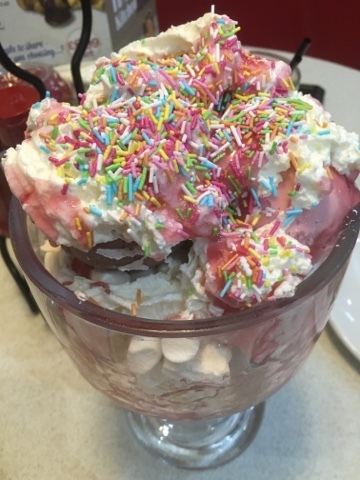 For dessert I asked if the Meringue Madness for two could be made for one person our server said yes but then proceeded to place in front of me a rather huge glass full of chocolate, strawberry and vanilla ice cream with added meringue, marshmallows, whipped cream, sauce and sprinkles. It was so delicious though and I couldn’t finish it all even though I did share this one. 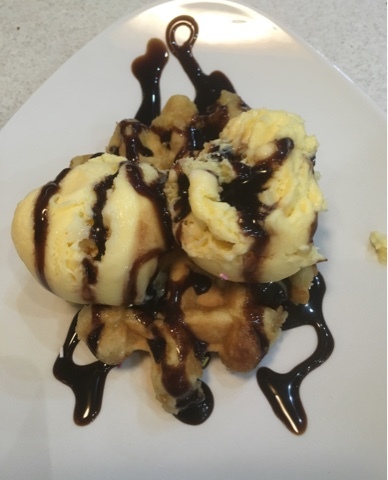 My husband had the Warm Waffle topped with ice cream and toffee sauce. After we had finished our food, we were taken over to the VIP Bowling area where we had our very own very cool lane, with comfy leather effect sofas and famous celebrity murals on the wall. Our host set up our games for us and then we were off. Iv always loved bowling I think no matter what age you are it is great fun. 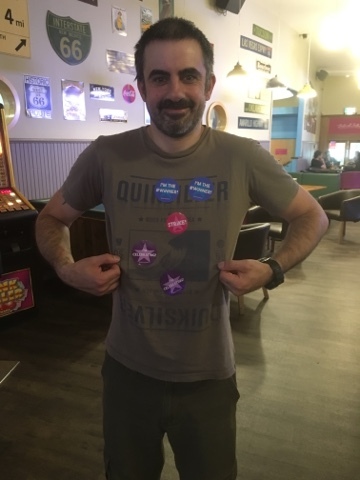 We played two games, both of which my husband won and he was very pleased when the host would come up and give him a sticker for each strike he scored and a sticker the winner of each game which was obviously him. We did have two technical hitches while have our food sitting down first before we started our bowling. Overall we had a really fun time on our date night with great food, bowling and excellent staff serving us. I would highly recommend Hollywood Bowl to anyone and it is also in an excellent location right at the heart of Cardiff Bay, in the Red Dragon Centre which also hosts a number of restaurants, pubs, arcades and a cinema. were there when the skittles didn’t come down but this was quickly resolved. Overall we had a really fun time on our date night with great food, bowling and excellent staff serving us. 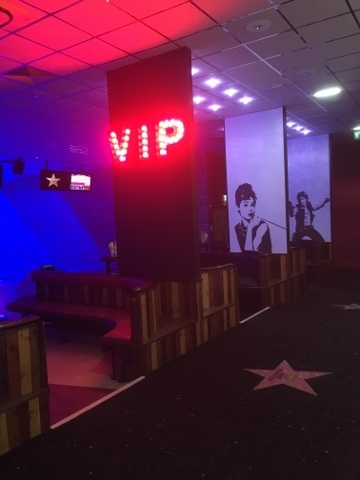 I would highly recommend Hollywood Bowl to anyone and it is also in an excellent location right at the heart of Cardiff Bay, in the Red Dragon Centre which also hosts a number of restaurants, pubs, arcades and a cinema.